Mytilineos operates three main businesses: metallurgy (aluminium/alumina production), power & gas (power production/supply and gas trading) and large-scale infrastructure EPC. The company operates in 29 countries across Europe, the Middle-East and Africa and has a workforce of 2,700 employees. Mytilineos leverages its low-cost structure and strong competitive positioning to generate robust cash flow (FCF yield of 14–16% in 2019–22e), supporting both dividends (3.7% FY18 yield with 13% CAGR) and large growth investments with potentially double-digit returns, which could boost current EBITDA by c 50% (in addition to our current forecasts). The stock trades at more than a 40% discount to other European diversified industrial companies on P/E and EV/EBITDA and at more than a 40% discount to a SOTP based on international peers’ multiples. Note: *Net income and EPS are normalised, excluding amortisation of acquired intangibles, exceptional items and share-based payments. Cost leadership is the key feature the three businesses (power generation/supply, alumina/aluminium production, infrastructure engineering, construction and procurement, EPC) have in common. 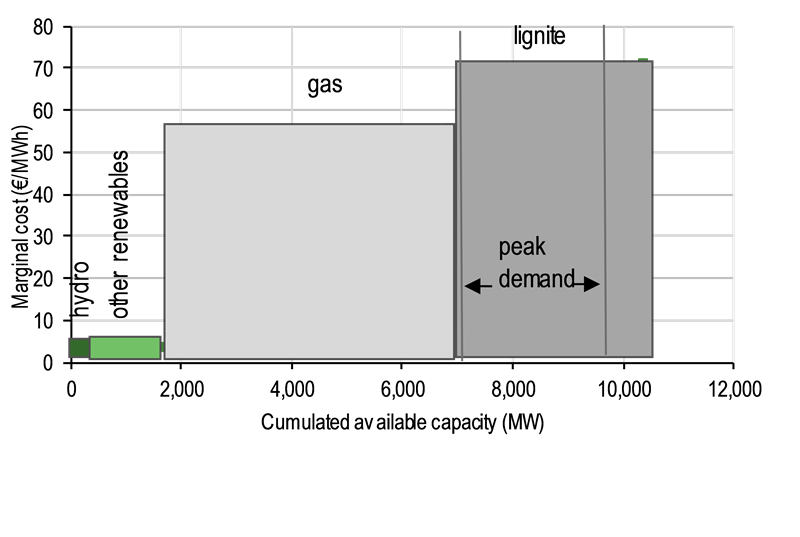 In particular, the highly efficient gas-fired plants and the access to cheap natural gas allow the Power & Gas business to achieve high load factors and higher-than-average margins. Production costs for both alumina/aluminium, which are in the first quartile globally, allow Metallurgy to be profitable and strongly cash flow generative. Overall, we forecast a 13% EPS CAGR in 2018–22e, driven by a tightening power market and growth for the EPC & Infrastructure business. Even assuming a relatively low statutory payout ratio of 35%, we calculate an FY18 dividend yield of 3.7% growing at 13% CAGR. We expect net debt/EBITDA of 1.4x to fall rapidly thanks to cash flow generation and EBITDA growth, and forecast the company to have net cash by 2022 in the absence of new large investments. We estimate c €800m balance sheet headroom by 2022 to deploy for new investments. Mytilineos is evaluating the construction of a new alumina refinery plant and of a new CCGT power plant. We estimate that both projects would have double-digit returns (combined 20% project IRR), well above the cost of capital, and would boost current EBITDA by c 50%. Based on current forward commodities prices, we forecast strong cash flow, with 14–16% free cash flow (FCF) yield (pre-growth capex) over 2019–22e. By applying the median valuation metrics of European diversified industrials, we calculate an average value of c €16.5/share for Mytilineos, a 70%+ premium to the current share price. 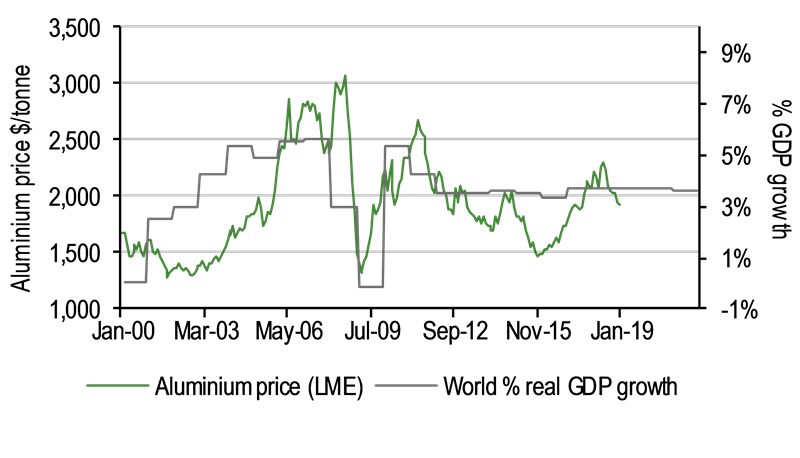 Similarly, a SOTP valuation using the EV/EBITDA of comparable peers implies more than a 40% discount to fair value. Finally, our DCF-based SOTP is €12.3/share, implying c 30% upside, even assuming a 15% discount to reflect the diversified business model. Key risks include higher/lower alumina/aluminium prices, an increase in power costs post-2020 and lower thermal margins. Mytilineos is a diversified industrial company operating in three main business areas: power generation/supply, alumina/aluminium production and EPC & Infrastructure. Over the years it has leveraged the synergies between the three divisions to build a portfolio of assets that have in common a low-cost, competitive positioning. In the metallurgy division, the company is first quartile on the global cost curve for both alumina and aluminium production; the gas-fired power plants are some of the most efficient in Greece and, thanks to the access to gas, which is at a discount to wholesale levels (based on company data), are among the lowest-cost thermal producers in the country. The EPC & Infrastructure division (Metka) has built a track record of diverse infrastructure development internationally while maintaining stable and relatively high margins. The 2017 merger was instrumental in extracting significant operational and financial synergies, and allowed for a lower cost of funding and the re/introduction of the dividend. Based on current forward commodity prices, we forecast very strong cash flow generation, with the company generating 14–16% FCF yield (pre-growth capex) over the period 2019–22e. By applying to Mytilineos the median P/E, EV/EBITDA, dividend yield and FCF yield of European diversified industrial companies, we calculate an average valuation of c €16.5/share, a 70%+ premium to the current share price. Similarly, a SOTP valuation using the EV/EBITDA of comparable peers implies more than 40% discount to fair value. Finally, our DCF-based SOTP implies €12.3/share value, even assuming a 15% discount to reflect the diversified business model of the company. We expect 13% EPS CAGR in 2018–22e for the group, with the growth driven mainly by the Power & gas division and to a lesser extent by the EPC & Infrastructure business. We expect a large jump in group profitability in 2019, which reflects aluminium prices hedged at a higher level than 2018, the full-year contribution of flexibility payments for gas-fired power plants and the impact of the large solar projects for the EPC business; we then expect a reduction in FY20e reflecting lower commodity prices and a normalisation in EPC revenues. Even assuming a relatively low payout ratio of around 35% (vs European diversified industrials of c 45%), we expect the dividend to grow at a 13% CAGR. Net debt/EBITDA of 1.4x at end FY18 should fall rapidly, thanks to cash flow and EBITDA growth; we forecast the company becomes net cash positive by 2022. We expect the company to use the cash flow for growth investments. Were Mytilineos to gear up to around 1.5x net debt/EBITDA in 2022, we estimate c €800m balance sheet headroom to deploy for new investments by then. These would be likely utilised for the construction of a new 1m tonne alumina refinery and a new 665MW CCGT power plant; a positive final investment decision on the CCGT project has been taken and construction could start by the end of 2019, provided a construction licence is granted. We estimate attractive returns for these investments (20% asset IRR for the two projects combined) and that they would boost current EBITDA by almost 50% when completed. In our view the key risks for Mytilineos are a reduction in commodity prices (alumina/aluminium in particular), an increase in electricity costs for the aluminium smelter and a reduction in power generation profits; we provide an earnings sensitivity analysis for each of these risks. We have stress-tested our FCF yield forecasts to reflect: 1) a 10% reduction in alumina/aluminium prices; 2) a reduction of 50% in gas-fired electricity margins (and removal of flexibility payments); and 3) a further €10/MWh rise in electricity costs for the aluminium smelter. We conclude the individual impact on the group of these risks is relatively limited as FCF yield remains well above 11% in all cases. A combination of these risks, however, may have a material impact on our forecasts. Mytilineos is a Greek diversified industrial company that operates in power generation and supply, alumina/aluminium production and infrastructure EPC, offering a degree of synergy between the units. Its key strategic objectives include the preservation of its cost leadership in the three businesses, in order to generate strong cash flow to finance new investments. Mytilineos was founded in 1990, building on Evangelos Mytilineos’s family business (a relatively small business operating in metallurgy), which dated back to 1908. After the listing on the Athens stock exchange in 1995, the first major transaction was the acquisition of a majority stake in Metka, Greece’s largest metals construction company, which became a leading international EPC contractor over the following years. In 2002, the group expanded into power generation, playing a key role in the liberalisation of the Greek market and becoming the second largest power producer after state-controlled PPC. In 2005 the group completed the acquisition of a 53% stake in Aluminium of Greece, a large vertically integrated alumina/aluminium producer. The group navigated the global financial crisis and the Greek crisis, at the same time expanding its Power & Gas business and participating in the gas market liberalisation. In 2017, a merger of Mytilineos Holdings with its subsidiaries Metka, Protergia and Aluminium of Greece was carried out. Today, Mytilineos operates three main businesses: metallurgy (aluminium/alumina production), energy (power production/supply, gas trading) and large-scale infrastructure EPC. While the bulk of the assets are located in Greece, the company operates in 29 countries across Europe, the Middle-East and Africa, with a workforce of 2,700 employees. Power generation: 2nd largest power producer in Greece generating 5.1TWh (2018), c 10% of the country's electricity consumption in the interconnected system. 1,387MW installed capacity of which 881MW CCGT, 334MW CHP, and 172MW wind. Electricity supply: subsidiary Protergia is among the largest private electricity suppliers to retail customers (1st for number of customers among private operators). Market share of 4.5% among Greek retail customers. Gas trading: 100%-owned subsidiary. Mytilineos is one of the largest gas importers into Greece (25% market share in LNG imports). Mytilineos owns the only vertically integrated bauxite mining, alumina refinery and aluminium smelter activities in the European Union. It is the 2nd largest bauxite producer in Greece and Europe, with an annual production of 650,000 metric tons of bauxite exclusively from underground mines. Annual production capacity of 820,000+ tons of alumina (14% of West Europe production) and 192,000 tons of aluminium (in addition to 35,000 tons of recycled aluminium from recently acquired EPALME), equivalent to 5% of West Europe production). Aluminium of Greece employs 1,100 people directly and 400 indirectly. Leading international EPC contractor mainly focused on power generation and infrastructure (railway, marine, bridges, buildings, defence). Experience of c 15GW of thermal power production projects and 1.2GW of solar/storage throughout Europe, the Middle East and Africa. Experience with very large plants (1,000MW+). End-to-end solutions from project development to O&M. Source: Mytilineos data, Edison Investment Research. Mytilineos’s business is largely driven by global dynamics (eg alumina/aluminium prices, US$/€, energy commodities, global infrastructure spending). However, its assets are almost entirely based in Greece and the company outlook is influenced by local market conditions, energy policy and regulation. In particular, the Greek natural gas and electricity markets have been going through significant changes as a result of a liberalisation process and the energy transition. Under the terms of the Greek third bailout package, a series of energy market reforms have been agreed with the EU in order to stimulate competition and to lower Greek gas and electricity prices, which are some of the highest in Europe. 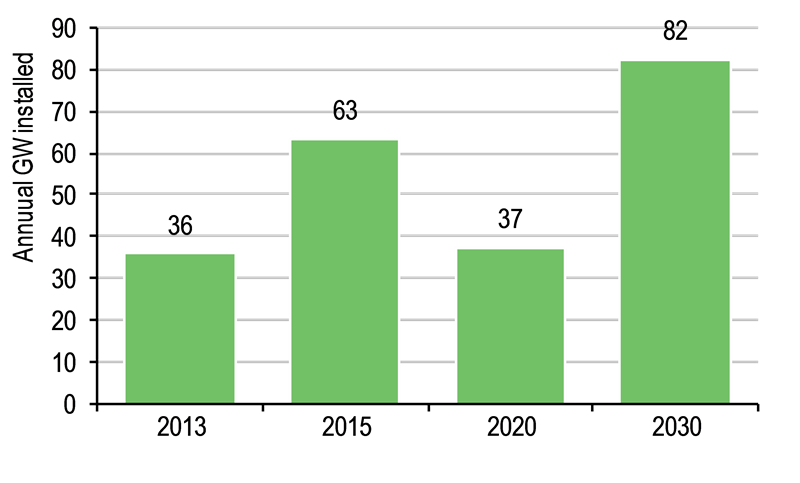 The reforms included the unbundling of gas/electricity networks from producers/suppliers, the reduction of PPC’s market share in electricity supply activities (in retail from c 80% to 50% by the end of 2019), and the sale by PPC of 40% of its lignite-fired generation capacity (Mytilineos submitted a binding bid for some of the assets, which was rejected; the sale process has restarted and is currently in the bidding process). While significant progress has been made, not all the objectives have yet been achieved and the liberalisation process is still incomplete: PPC and DEPA dominate, respectively, the electricity generation/supply and natural gas markets, and neither industrial nor retail tariffs are yet aligned with market prices (including Mytilineos’s metallurgy business, which purchases electricity at a price well below market levels). 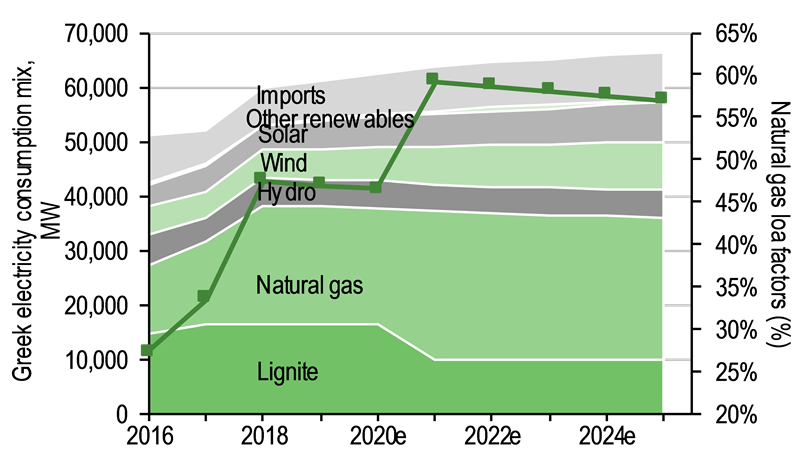 In addition to these reforms, large structural trends are having a material impact on the power generation market: the cost of renewable installations has reduced dramatically, and this has encouraged the Greek government to announce a plan of new renewable investments for 2.6GW of new capacity (through an auction system in which Mytilineos is planning to participate), although renewable projects in Greece have historically been subject to significant delays. Russian gas still dominates Greek imports, but rising LNG imports (including from the US) and new pipeline capacity should diversify imports and lower prices. 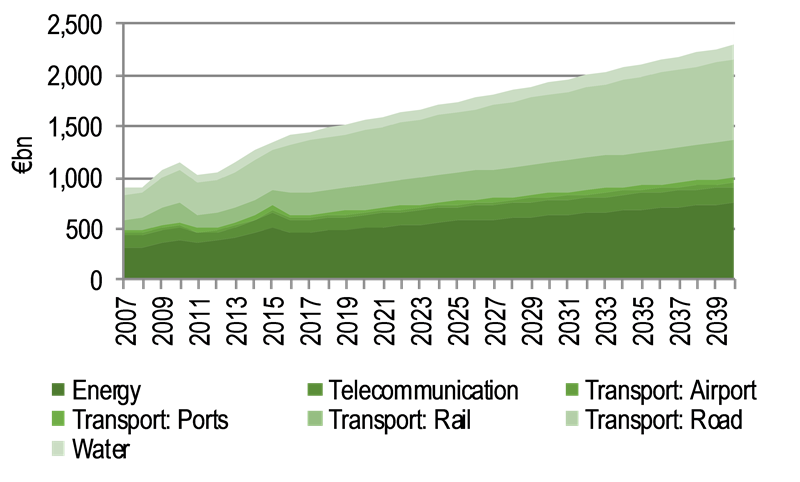 Furthermore, rising carbon emissions costs have greatly increased the production costs of the ageing Greek lignite-fired power plant fleet, opening the way for new investments in efficient and more environmentally friendly thermal capacity (Mytilineos has taken a final investment decision for a new CCGT plant; construction could start before the end of 2019, provided a construction licence is granted). Over the last 15 years, Mytilineos has taken advantage of the liberalisation of natural gas and electricity markets to establish its power generation/supply and natural gas import/trading businesses. The gradual opening up of the energy market provides the company with new opportunities (renewable and gas investments, a larger role in gas supply) as well as some challenges (electricity costs for aluminium smelter operations). 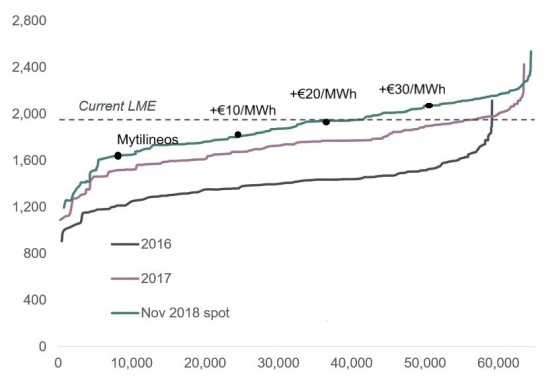 Mytilineos has taken advantage of the liberalisation of the electricity market in the early 2000s to build a sizeable generation business, and now is the second largest power producer in Greece, behind state-owned PPC. Mytilineos owns two highly efficient CCGT plants (combined capacity of 881MW), a 334MW CHP plant, which supplies steam to the metallurgy business, and a significant wind portfolio (c 200MW including 35MW coming on stream by the end of 2019). In the Greek power market, all electricity produced is acquired by a centralised mandatory pool and producers receive the same system marginal price. Gas-fired plants operate on a merchant basis and profitability is determined by a ‘clean spark spread’ (ie the difference between the power price achieved on the market and costs of natural gas and carbon costs), as well as a remuneration for providing flexibility services. A forward electricity market is expected to be introduced in the next few years, but at the moment operators mostly operate on the day-ahead market. Windfarms instead receive a fixed fee (above €80/MWh for existing Mytilineos assets) and for new investments the contract price will be determined by auctions in 2018–20. Greek CCGTs run at relatively high load factors (50%+) when compared to other European countries, reflecting their competitiveness compared to lignite plants at a time when the cost of emitting CO2 (ie the EU ETS carbon price) has increased dramatically. Mytilineos plants are some of the lowest cost in the country due to their high efficiency (57% efficiency, which is the highest in the country at present according to Mytilineos) and thanks to the ability to source gas internationally at prices at a discount to wholesale levels (c 10% average discount in FY18 according to company data). Mytilineos is one of the largest Greek gas players, importing >30% of Greek gas (1.3bcm via pipeline and LNG in 2018) with both long-term contracts and spot purchases. In particular, we believe the presence on the LNG market should allow the company to capture short-term trading opportunities in the context of European gas markets where we feel price volatility is likely to increase over time. The Greek gas market is still dominated by Russian oil-indexed gas and wholesale prices are generally at a 4–5% premium to most other European countries. Source: Mytilineos. Note: System marginal price was €73.5/MWh. In addition to power generation, Mytilineos has developed a sizeable Greek retail electricity supply business (Protergia), which has the highest number of customers among private operators. Its market share has increased significantly over the years, but the business generates only a negligible portion of the division’s and group’s EBITDA as low tariffs by state-owned PPC (which runs a loss-making supply business) effectively do not allow the development of a profitable business. PPC currently has a market share of c 80%, but, under the third bailout package agreed with the Troika in 2015, its market share has to reduce to less than 50% by the end of 2019, which at the moment appears unlikely even though the lignite sale process may accelerate the reduction. Mytilineos owns a vertically integrated metallurgy business, with bauxite mines, an alumina refinery and an aluminium smelter. It competes on a global scale with significantly larger players (the top five alumina producers globally are Alcoa, Chalco, Rio Tinto, Rusal and Norsk Hydro; the top five aluminium producers are China Hongqiao Group, Aluminium Corp. of China, Shandong Xinfa, UC Rusal and Rio Tinto). Mytilineos’s key strengths are the vertical integration and the cost efficiency of its operations. The vertical integration allows the aluminium production business to be insulated by variations in alumina prices, so avoiding that the plant is running at a loss. This was particularly clear in 2018, when a spike in alumina prices drove losses for aluminium smelters which were not vertically integrated and allowed extra profits for Mytilineos. In addition, we estimate Mytilineos is in the first quartile globally for both alumina and aluminium production, despite its significantly smaller scale. The efficiency of the operations, the ability to source locally mined bauxite, the presence of an on-site CHP plant and access to competitive natural gas/power are the key drivers of the low-cost structure. Bauxite mines are located in proximity to the alumina refinery and have an annual production capacity of c 0.65Mt/year and reserves of 11Mt (ie c 17 years remaining if used at full capacity). We estimate internally sourced bauxite will cover c 30% of 2019e alumina production. The remaining bauxite is sourced externally from other Greek mines, at a similar cost to internally mined bauxite and Africa (from Glencore, more expensive due to transport costs) under long-term contracts. Overall the mix of Greek (including internally sourced) and tropical bauxite is 75%/25%, as this is the proportion that, according to the company, optimises the production process/costs (Greek bauxite is richer in alumina but more difficult/expensive to process). The sale of alumina (470k tonnes in 2019e) generates around one-third of the metallurgy business EBITDA (2019e). 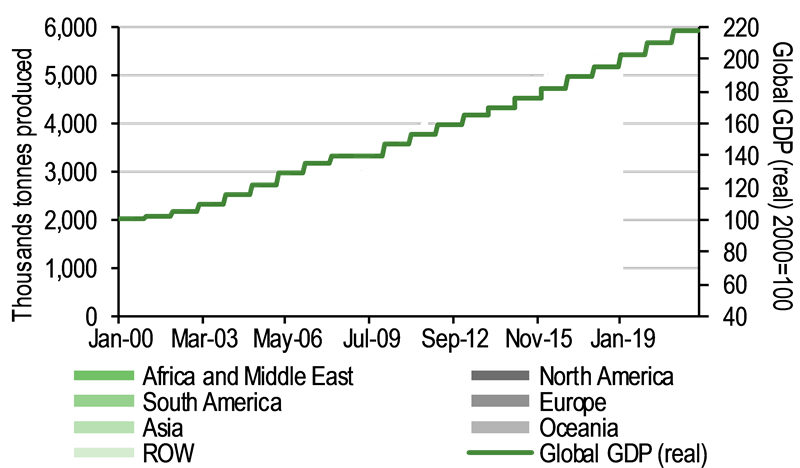 We estimate 44% of the alumina produced in 2019 will be utilised internally for the production of aluminium, while the remaining 56% will be sold externally to third parties under long-term off-take contracts. Although the alumina refinery is a relatively old plant (it started its operations in 1966), it is profitable and competitive, following three large cost-cutting initiatives since 2012, efficiency improvements (eg improved transport and logistics) and significant investments. Among these, an on-site, gas-fired 334MW CHP plant came on stream in 2007, which has allowed more expensive (and polluting) fuel-oil to be abandoned (we estimate steam costs represents 17% of 2019 alumina production costs). We estimate (Exhibit 5) that bauxite costs represent c 40% of Mytilineos’s alumina production costs. The total unitary production cost of around $230/tonne is well below the current forward alumina price of $375/tonne (CME Group), which means the alumina refinery is cash-flow generative at current commodity prices. In Exhibit 6 we show that our estimate positions Mytilineos in the first quartile of a global cost curve. We calculate Mytilineos’s aluminium production is also in the first quartile on a global cost curve (Exhibit 8). 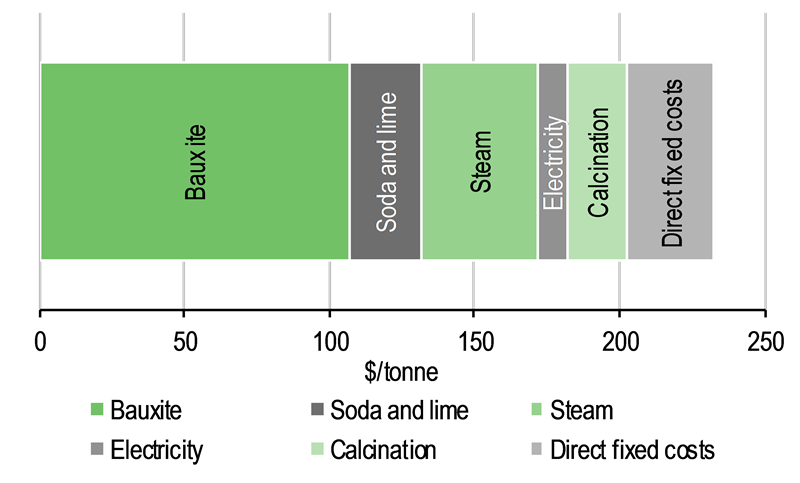 Unlike the alumina refinery process, the aluminium production process requires a large amount of electricity; we estimate around one-third of production costs are electricity purchases. The renegotiation of the contract with state-owned PPC in 2016 was the key driver of the cost reduction for the company. However, the off-take electricity purchase contract expires at the end of 2020 and Mytilineos is working for a replacement solution (see Sensitivity section for more details). Mytilineos is also focusing on strengthening its aluminium scrap recycling business, with the acquisition of EPALME (c 35k aluminium tonnes production, equivalent to c 20% of Mytilineos’s primary aluminium production). Mytilineos’s EPC and Infrastructure business (formerly known as Metka) is a developer of large infrastructure projects, providing EPC services for the development of turnkey solutions and for the provisions of O&M services. 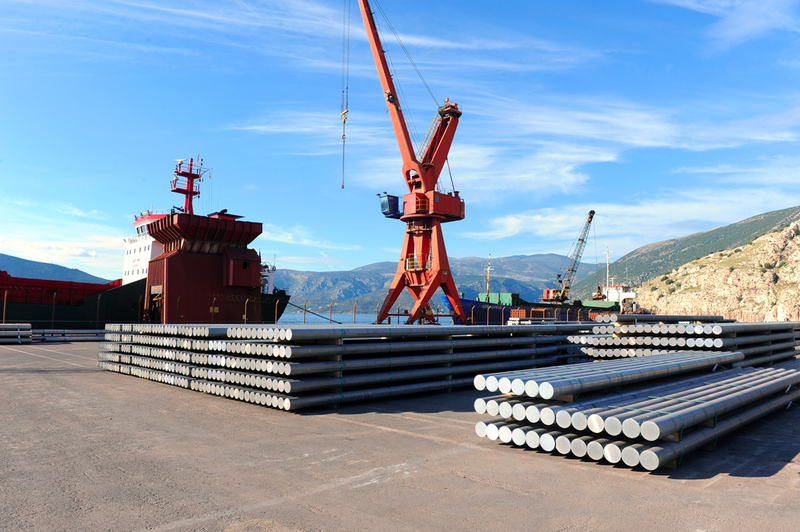 The business owns large manufacturing facilities in Volos, Greece, for the construction of heavy and complex steel fabrications for energy, infrastructure and defence applications (eg large steel components of power plants, bridges and industrial facilities). Its key expertise is in power generation, but it has a significant track record with other large projects such as rail transportation, marine works, certified buildings and waste management. In power generation the company has engineering and construction experience in 17 countries (mostly in Europe, the Middle East and Africa), with c 15,000MW of thermal projects (with plant size capability of 1,000MW+) and 1,200MW of solar energy and storage projects. By analysing the projects in execution (with a total value of €1.6bn), we can provide an overview of the business mix: around 80% of the current contracts’ value is from power generation, while the remaining 20% is from other infrastructure (railways and logistics). In power generation, around two-thirds of the business is from traditional thermal projects, while one-third is from solar installations, indicating large upside in renewable backlog in the future (50%-owned subsidiary Metka EGN is responsible for renewable/storage projects). From an economic point of view, we believe the key attractiveness of this business is the relatively high margin achieved by the business and, most of all, its stability over time (with an EBITDA margin ranging between 15% and 19% in the period 2011–18). Mytilineos’s EPC & Infrastructure business operates in a highly competitive environment. Its competitors include a wide range of infrastructure developers, including solar developers (eg Spain’s Prodiel and several Chinese companies such as Power China and Beijing Enterprises Clean Energy Group), railway infrastructure developers (eg Alstom) and other large companies developing large infrastructure projects (Siemens, General Electric, Acciona, Vinci, ENKA). Mytilineos’s strategy is focused on preserving its competitive positioning (top quartile cost curve in alumina/aluminium production, low-cost power generation fleet, attractive pricing in EPC) to maintain and gradually grow its cash flow generation to finance new investments and generate additional value for shareholders. Two large growth projects are currently under evaluation: a new 665MW gas-fired power plant (c $300m investment) and a new 1 million tonne alumina production plant (c $400m investment). The company has grown by exploiting the strong synergies between its businesses: the EPC business allowed the construction of CHP and CCGT plants (among the most efficient in Greece); the start-up of the CHP plant and the ability of the Power & Gas business to source natural gas at prices that the company believes are at a discount to wholesale levels were key drivers of the cost reduction for the alumina refinery. Furthermore, because of the EPC business’s construction expertise, the new alumina refinery plant and a new CCGT are being considered. We summarise the key strategic objectives for each division in Exhibit 11. To continue to expand the business by investing in new generation capacity (mostly wind and gas-fired), leveraging on its access to gas imports at competitive prices. Mytilineos targets an increasing share in the generation market, supporting its position as the largest IPP in Greece. To maintain its strong competitive positioning by securing low electricity costs (post 2020) and Greek bauxite at competitive prices. In addition, the company targets an expansion of the production capacity (a new alumina refinery is under evaluation and increased aluminium volumes are targeted, also through scrap aluminium recycling). Diversification of the activities (both from a geographical and business point of view), refocusing on higher growth business such as renewable solutions, off-grid and hybrid power plants. In addition, the takeover by Mytilineos and the resulting higher financial resources available to the group have increased its willingness to invest its own capital in the projects. Mytilineos is considering expanding its activities into Build, Operate and Transfer (BOT) for selected solar projects. The corporate history of the Mytilineos group coincides with the entrepreneurial career of Evangelos G Mytilineos, CEO and chairman. After graduating with a BSc in economics from the University of Athens and an MSc in economics from the London School of Economics, he took over the family business in 1978 and in 1990 he founded MYTILINEOS Holdings Group. By acquiring the majority shareholding of METKA SA (1998), Aluminium of Greece (2005) and making sizeable investments in the energy sector (it is the second largest power producer in Greece), he turned the company into one of Greece’s largest industrial groups, generating 0.6% of the country’s GDP. The Greek electricity system is going through a large transformational process as a result of the energy transition. We believe Mytilineos’s power assets are well-placed to take advantage of the evolving market structure. We expect gas plants to benefit from gradual lignite closures and see growth opportunities from the Greek government’s large renewable investment plan. We believe Mytilineos’s gas plants will play an increasing role in supporting the stability of the system as old Greek lignite plants (running baseload) are gradually closed and replaced with intermittent renewable sources. Although there is uncertainty over the timing of the closure of lignite plants, it is reasonable to assume an increase in capacity utilisation for gas plants in the medium term and increasing revenues for flexibility remuneration, driving higher profitability for Power & Gas. EU Directives (‘Large Combustion Plant’ and ‘Industrial Emissions’) pose significant restrictions to their operations, although the Greek government (majority shareholder of incumbent power company PPC) has so far resisted plant closures in order to safeguard employment. Plants face unfavourable economics as the cost of carbon emissions rises (Exhibit 12) and as Greek lignite is very low-quality (hence much more expensive) compared to the rest of Europe. 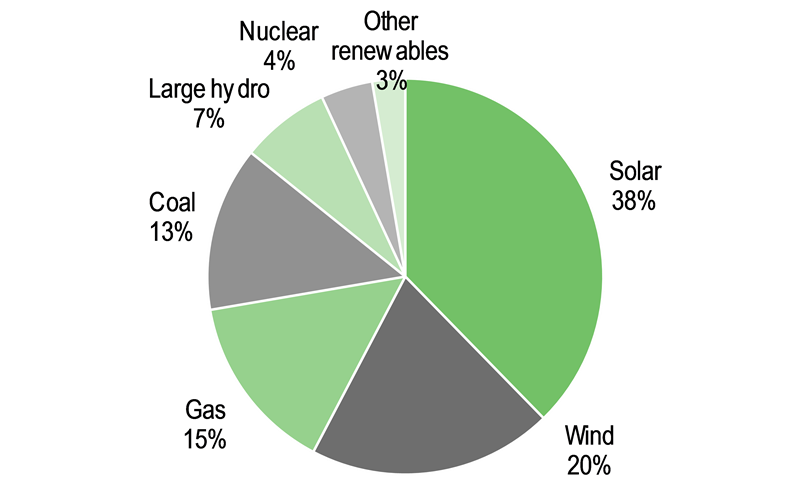 Lignite plants already are generally more expensive than gas plants, as shown in Exhibits 13 and 14. Source: Edison Investment Research. Note: Based on average Greek efficiency rates for the technologies as estimated by Edison. Source: Edison Investment Research. 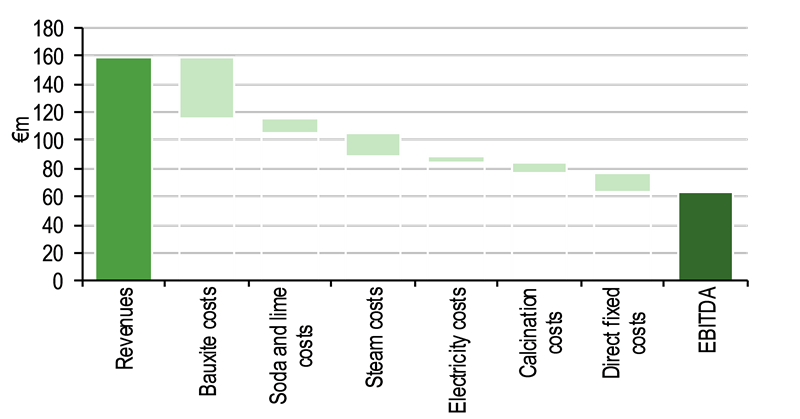 Note: Based on average Greek efficiency rates for the technologies, as estimated by Edison. PPC has announced the closure of 1,212MW of lignite capacity by 2021 amid challenging market and regulatory conditions and environmental concerns. In addition, the Amyntaio power plant (330MW) is likely to close due to environmental restrictions (it is already operating in breach of EU regulations as of 2019). Were these plants to close, assuming no new thermal capacity comes on line and even assuming a large pick-up in renewable investments, our Greek power market model indicates a significant reduction in power reserve margins (ie the difference between the available capacity of the plants and the peak demand of the system, which provides an indication of oversupply/undersupply of the system) and a large increase in gas plant utilisation (Exhibit 16). Hence, we would view positively the construction of a new CCGT plant by Mytilineos, as this would likely achieve high load factors (the company expects to run it baseload) and increasing spreads as the market tightens. A transitory mechanism to compensate for flexible generation capacity (CAT) was introduced in Greece in 2018, following approval by the EU Commission. The framework is designed to compensate up to 4,500MW hydro and gas plants for providing flexibility to the market and the plants eligible for the payment are selected based on a descending-price auction with a starting price of €39,000/MW. At the 2018 auction, Mytilineos secured the payment for 70% of its capacity at a price of €39,000/MW. Were future quarterly auctions to confirm payments at this level a €29m payment could be expected for 2019 (vs a contribution of €6m in 2018 as the mechanism started in Q4). A permanent mechanism post 2019 has been proposed and is currently under evaluation by the EU Commission, which is expected to respond after April 2019. We assume Mytilineos continues to receive the same annual payment as it did in 2019 from 2020. In 2018, the Greek government launched a large renewable investment plan, which targets wind and solar additions for a total capacity of 2.6GW (equivalent to c 15% of the country’s current total installed capacity and to c 50% of current renewable capacity) requiring investment of €2.5–3.0bn. The projects are assigned through tender auctions in the period 2018–20 (300MW/year for both wind and solar and two 400MW technology-neutral auctions where wind and solar compete against each other). The first auction was carried out in July 2018 (average price €70/MWh) and the second one in December 2018 (€59/MWh). We believe these plans offer significant investment opportunities for Mytilineos, although we recognize that historically renewable projects were subject to significant delays as a result of a difficult authorisation process. As an indication of the profit potential, were the company to maintain the current proportion of the country’s installed renewable capacity, we would see room for 100MW additions in the period 2018–20, which would generate an additional c €10m/year EBITDA and a project IRR of 9%, on our estimates. As shown in Exhibit 17 we assume a moderate expansion in margins and a gradual increase in gas plant load factors (as the market tightens), additional flexibility remuneration and 30MW/year wind additions. Overall, we expect 18% 2018–22e EBITDA CAGR, excluding the contribution from the potential new CCGT plant. We view our forecasts as conservative because, although we included a gradual increase in margins and load factors, we have not included the full impact of the lignite closures (large increase in spreads and gas-fired production), due to the current uncertainty on the timing of the shutdowns. 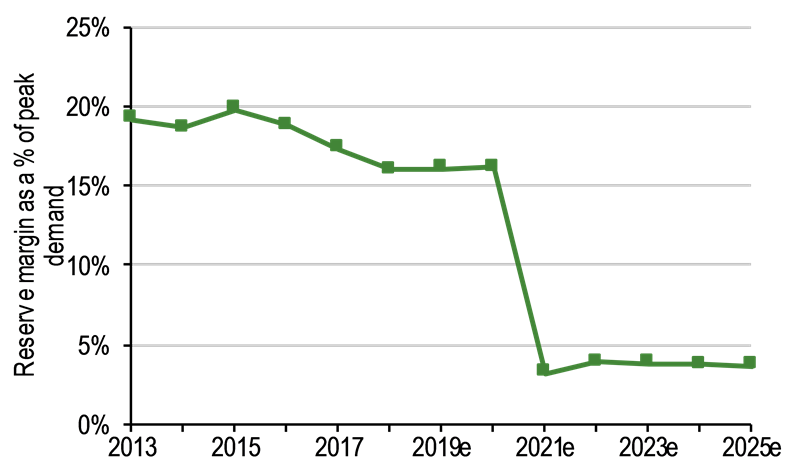 Furthermore, in the short term the decline of wholesale gas prices in Q119 has expanded profit margins for gas-fired plants in Greece (as more expensive lignite plants have a key role in setting the power price). The recent decline in gas prices creates upside risks to market forecasts for FY19 results. Assuming current forward prices (Exhibit 20) for alumina and aluminium, we expect the metallurgy business to continue to generate strong cash flow for the group (more than €100m/year of free cash flow, equivalent to around 50% of the group). Even following recent declines, current forward prices for alumina and aluminium are well above production costs for Mytilineos. As shown in Exhibits 18 and 19, we estimate c $230/tonne production costs for alumina (vs current forward price of $375/tonne) and c $1,600/tonne for aluminium (vs current one-year forward LME price of c $2,000/tonne). 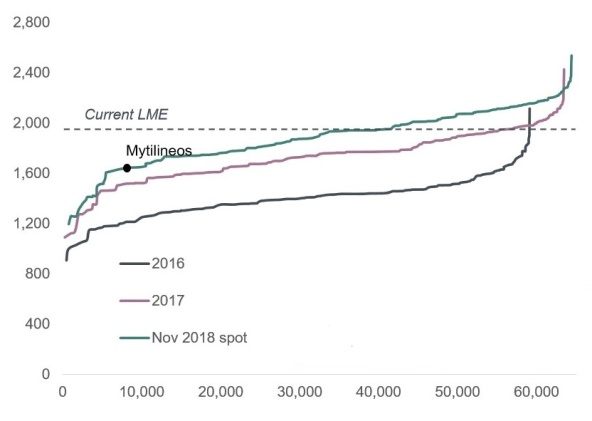 Our forecasts for Mytilineos include our estimates for hedged prices for 2019; from 2020 we use the forward curve. We expect a large increase in 2019 achieved aluminium prices (to almost $2,200/tonne) thanks to hedging at higher prices in 2017/18. However, we expect a 15%+ decline in alumina achieved prices in 2019 (to $400/tonne), following the 2018 spike. In addition, to reflect the risk of a change in the electricity supply contract with PPC post-2020, we have assumed a €15/MWh increase in power prices (c 30%) – see the sensitivity section for more details. The profitability of the Mytilineos metallurgy business is ultimately dependent on commodity prices rather than volumes, for which we expect only moderate growth (excluding new investments). The outlook on prices depends on the global supply-demand picture, for which the global economic growth outlook is a key input. Global consumption of aluminium has posted the strongest growth among base metals since 2000 mainly thanks to large demand growth in China, which currently consumes c 55% of global aluminium production. The growth is likely to moderate, reflecting lower Asian growth, but consumption is still likely to continue grow at a sustained space. Norsk Hydro estimates aluminium demand growth at around 3% in the period 2018–28 (with the same growth for both China and the rest of the world) vs a 5.4% CAGR in the period 2000–18 (China 13.8%, rest of the world 2.4%). Similarly, Alcoa estimates a 3.4% CAGR in 2018–23. Source: CRU, Norsk Hydro. Note: 2018–28 forecasts represent the mid-point of the ranges provided. We believe certain structural growth trends support aluminium demand (urbanisation, growth in e-mobility as electric cars contain c 30% more aluminium than combustion-engine vehicles), but ultimately, we see a strong correlation between global GDP and aluminium demand. The aluminium market was in deficit for five years in a row (Alcoa estimates -1.2/-1.4mt in 2018), which has reduced the very large inventories that built up during 2008–13 to pre-crisis levels. 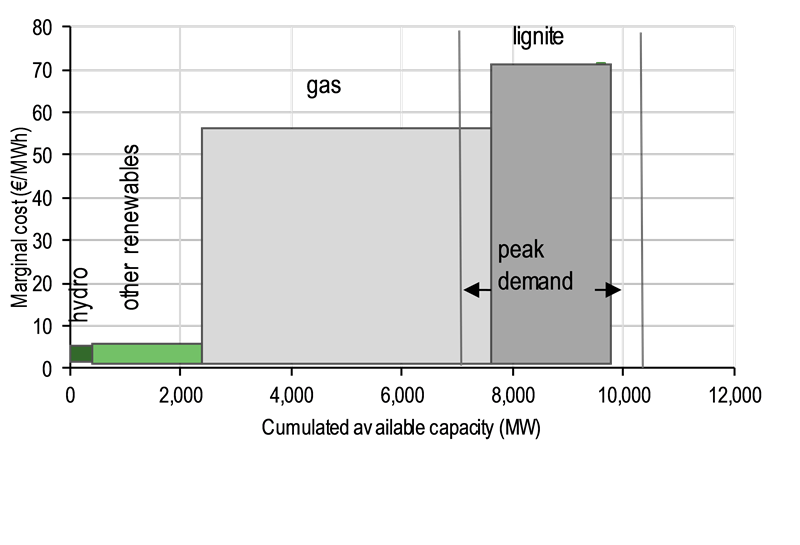 In our view the recent aluminium price decline reflects the expectation of both a pick-up in supply (including Alunorte restarting and despite significant capacity closures in China, where most of the 40% of loss-making smelters are located) and a moderation in demand (reflecting recent downward revisions in global GDP growth). However, Norsk Hydro and Alcoa believe a gradual re-alignment between supply and demand will not be sufficient to avoid a deficit in 2019. 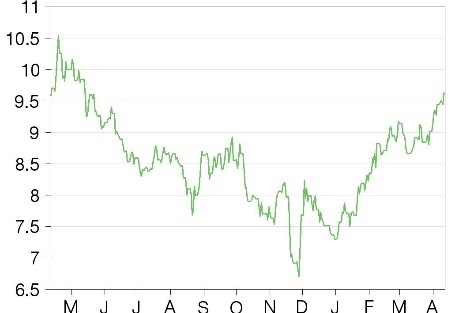 In addition to a gradual rebalancing between supply and demand, the recent decline in the alumina price (following the spike in 2018) and the removal of sanction against UC Rusal, the second-largest aluminium producer in the world (which drove aluminium prices higher in 2018) also led to a decline in prices over the last few months. The forward curve is, however, in a rather steep contango; the key risk is that a worse than expected global economic outlook flattens the curve, in our view. In 2018 alumina prices spiked mainly on the news of the closure of 50% of the capacity of the largest refinery in the world, Norsk Hydro’s Alunorte plant in Brazil (on environmental grounds). In January 2019 a regional court removed the embargo on the plant, and production can restart after the decision of a federal court. Production is expected to restart in H219 and the alumina price has declined in anticipation of this. As a result of increasing global production (Alunorte restart and the commissioning of the Al Taweelah alumina refinery with a production capacity of 2mt/year) and moderate Chinese demand growth, the market is likely to move to a small surplus (Alcoa estimates 0.2/1.0mt) from a deficit in 2018, which, combined with the concerns about global economic growth, justifies recent downward pressure on prices in our view. We incorporate a flat $375/tonne price assumption in our forecasts. We highlight that the vertical integration of Mytilineos means the aluminium smelter is not exposed to variations in alumina prices, which is not the case for many competitors. By combining the outlook for Europe, Asia and Africa, the three main regions where the EPC & Infrastructure business operates, we calculate total infrastructure investments in these regions will grow at 2.0% CAGR (2018–40, based on data by the Global Infrastructure Hub – Exhibit 26). Focusing on power generation, where most of its business is concentrated (around 80% of current projects in execution), we expect its business to transition to a much higher weight of renewable projects as opposed to large thermal power plants. In Exhibit 27, we show that global solar and wind installations already represent c 60% of annual installations. This contrasts with Mytilineos’s power generation backlog of one-third renewable and two-thirds thermal projects. Renewables growth (especially solar) is likely to continue at a sustained pace (Exhibits 28 and 29), as costs are reduced dramatically. The stronger renewable growth outlook is likely to change the project mix for Mytilineos, with thermal projects, which historically represented c 80% of power generation business, likely to reduce to around 50% over the next few years (current projects in execution are around 65%). Renewable projects may create new business opportunities for Mytilineos but also have significant implications for the EPC business’s margins, as renewable projects’ margins are generally lower than both thermal projects and current margins for the division. Solar developers’ margins are typically sub-10% (eg Prodiel 8%). Mytilineos reported an EBITDA margin of 5.3% in FY18. As the proportion of renewable projects grow, the company is likely to experience a dilution to margins. 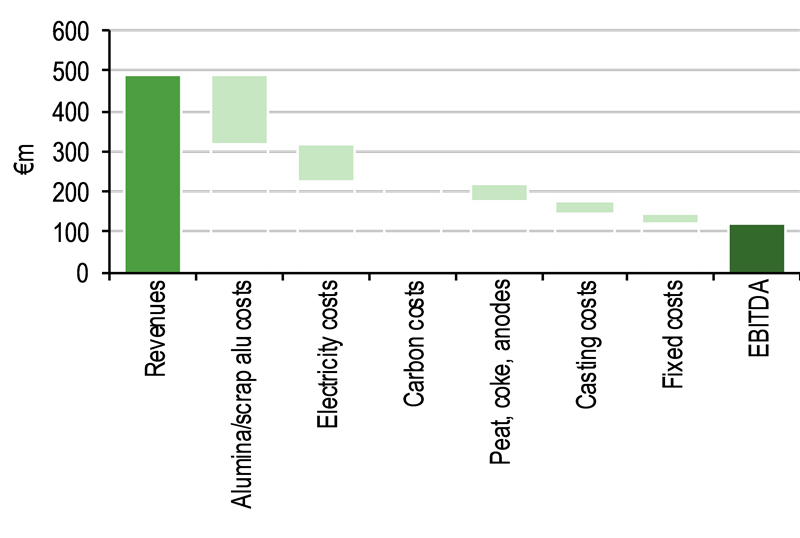 Current EPC’s margins stand out when compared to a wide range of infrastructure developers (with various business models), as shown in Exhibit 30. In the longer term we expect Mytilineos to focus on more innovative projects that could at least partly offset the reduction in margins. Electricity storage projects (Mytilineos has developed projects with a total capacity of 100MW in UK and Puerto Rico), hybrid power plants and off-grid solutions (where solar plants are typically integrated with batteries or fuel-oil generators) are likely to experience very strong growth over the next few years (albeit from low levels) and usually enjoy higher profitability due to their complexity. Additional profit opportunities may derive from Mytilineos’s willingness to participate in the financing of the infrastructure projects. Although this may increase the risk of its business, the extent of the investments would be limited to the absolute profit margin targeted in the project. 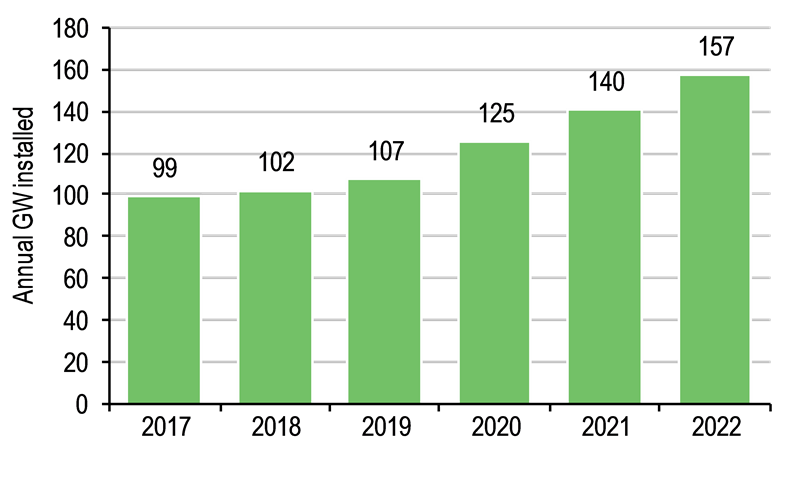 In our forecasts we have incorporated very strong revenue growth for EPC & Infrastructure in FY19 (vs relatively low sales in 2018) due to the roll-over into 2019 of large projects initially expected for 2018 (Ghana and Libya) and large contribution from solar projects). We expect a large reduction in margins in FY19 to reflect the big weight of solar projects. Overall, we forecast a 15% EBITDA CAGR 2018–22e, which is conservative considering in particular the opportunities in solar EPC but on which we do not have much visibility at the moment. The corporate history of the Mytilineos group coincides with the entrepreneurial career of Evangelos G Mytilineos, CEO and chairman. After graduating with a BSc in economics from the University of Athens and an MSc in economics from the London School of Economics, he took over the family business in 1978 and in 1990 founded MYTILINEOS Holdings Group. By acquiring the majority shareholding of METKA SA (1998), Aluminium of Greece (2005) and making sizeable investments in the energy sector (it is now the second largest power producer in Greece), he turned the company into one of Greece’s leading industrial groups. Dimitri Stefanidis, general manager of Metallurgy has an engineering background and 35 years of experience in aluminium. He joined Aluminium of Greece in 1984, where he assumed increasing responsibilities. He has international experience at Pechiney Group (1992 to 1996) and as continuous improvement director and then as technical manager of ALCAN’s plant in Tomago, Australia (2002–05). In 2009 he was appointed CEO of Aluminium of Greece and oversaw several cost-cutting exercises that significantly improved the competitive position of the company. Dinos A Benroubi, general manager of electric power, has an engineering background and studied in the US. He has 25 years’ experience at the TITAN CEMENT Group, where he reached the position of director of cement operations – Greece, and spent two years in VIOHALKO S.A., where he served as general manager of the ELVAL Group. He joined Mytilineos in 2006 and was appointed CEO of KORINTHOS POWER SA in 2009 and general manager of Protergia in 2010. Panayotis Kanellopoulos, head of the gas division, is responsible for securing competitive natural gas supply for the company’s own use, as well as for the broader Greek market and neighbouring countries. Panayotis joined Mytilineos in 2010 as executive director with responsibility for natural gas activities. Previously, he was CEO of the Hellenic Natural Gas Transmission System Operator (DESFA), where he initiated efforts and set up the basis for the opening of the Greek natural gas market. Earlier in his career, he held positions ranging from sales manager to supply chain director for the East Med cluster in MOBIL and BP Hellas, gaining management experience in both sales and operations in the national and international energy sector. Panagiotis Gardelinos, general manager of the EPC business unit, graduated from the NTUA, with a degree in mechanical engineering. He brings 32 years’ experience in the power sector, working in various positions with EPC contractors in Greece and Denmark, and joined Mytilineos in 2006. The management is very focused on improving its ESG practices and regularly publishes a Sustainable Development Report. Over the years the company has adopted several initiatives in order to improve its environmental footprint, focusing on the management of the bauxite residues and emissions improvement. In terms of corporate governance, the board of directors includes more than 60% independent directors. Compared to Greek companies, Mytilineos performs well on governance scores by the Institutional Shareholder Service (ISS), with a score of 3 on a scale of 1–10 (where 1 is low risk and 10 is high risk), which is the highest among Greek companies. In our view the key risks for Mytilineos are a reduction in commodity prices (alumina/aluminium in particular), an increase in electricity costs for the aluminium smelter and a reduction in power generation profits. In this section we provide the key sensitivities to the main drivers of its businesses. Alumina and aluminium prices: we estimate a ±10% change in the alumina price would increase or decrease group 2019e EBITDA by 8% (full year impact, on an unhedged basis). Similarly, a ±10% change in the aluminium price would increase or decrease group EBITDA by 10%. 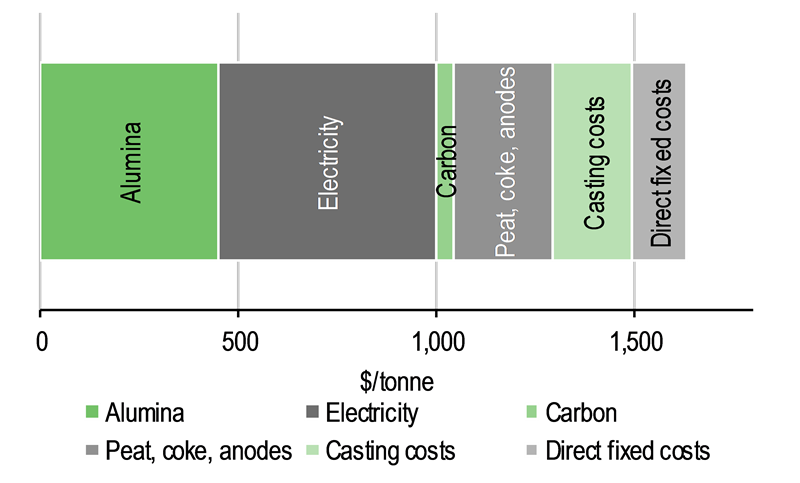 Power costs for aluminium production: as the production of aluminium requires a large amount of electricity, its purchase cost is a key driver of the profitability of the aluminium smelter. Mytilineos currently purchases electricity from PPC at attractive prices with a contract that expires at the end of 2020. The purchase price is €37.5/MWh, as long as the aluminium price stays below $1,800/tonne (+€1.25/MWh for each $100/tonne above that level). Investors should consider the risk that the purchase price rises at the next renegotiation. However, at the FY18 results management stated that it is confident that the pricing conditions post-2020 will be similar to the levels in the year before the contract expiry. As a sensitivity we estimate that a €10/MWh increase in electricity prices would reduce group 2019e EBITDA by 7%. Power generation profitability: we currently assume gas-fired plants achieve an all-in clean spark spread (including plant restart payments) of around €10/MWh in 2019 with moderate growth thereafter (to €12/MWh in 2022). We estimate a ±€5/MWh change in spreads would increase or decrease EBITDA by 6%. New investments/balance sheet deployment: Mytilineos is considering two large investments (not included in our forecasts as no final investment decision has been taken): a gas-fired CCGT power plant and a new alumina refinery plant. We estimate strong returns for these projects: a 20% project IRR for the CCGT plant and 21% for the alumina refinery, at current commodity prices and cost structure (20% for the two combined projects). The combined positive contribution of the two projects is €180m EBITDA (50% 2019e group EBITDA) and €87m net income (42% of group net income), on our estimates. The final investment decision on the CCGT project has been taken and construction could start before the end of 2019, provided a construction licence is granted. In addition, a process is under way at PPC to dispose of 930MW lignite generation capacity and lignite exploitation rights (under the request of the EU Commission, which wants to promote more competition). In February 2019 Ekathimerini reported that PPC rejected two binding bids for the purchase of the assets, including one offer from the Mytilineos group (€25m for the Meliti plants). The sale process has now restarted and it is currently in the bidding stage. We highlight that the Mytilineos offer would have involved a very small cash outflow in the context of the group’s size, but due to the lack of information at this stage, we do not take a view on this potential deal. In Exhibit 34, we have stress-tested our FCF yield forecasts to assess the impact of 1) higher electricity costs (further €10/MWh rise in electricity costs for metallurgy division from 2021, on top of the €15/MWh rise we have already incorporated in our base case); 2) lower CCGT profits (50% reduction in achieved clean spark spreads and no flexibility remuneration); and 3) lower alumina/aluminium prices (10% reduction vs forward prices from 2020). We show the individual cash flow impact of these risks is rather limited and the FCF yield remains well above 11% in all scenarios; the combined impact of these risks may, however, be significant. From a valuation point of view, we believe the company’s key attractiveness is its ability to generate strong cash flow on a sustainable basis (pre growth capex). We estimate a free cash flow generation of c €200m/year in the period 2019–22e (post maintenance capex of €45m/year), implying an FCF yield of 14/16% in FY19e/22e. Under our assumptions the cash flow generation is partly used for certain growth investments (mainly windfarm investments of c €35m/year) and for dividend payments (c €70m/year on average, implying a 5.5% average dividend yield in 2019–22e). Under our assumptions, however, the net debt reduces rapidly and the company will be debt-free within five years. We believe that the strong cash flow generation provides significant room for funding new investments, such as the two large projects that Mytilineos is evaluating (a CCGT plant and a new alumina refinery plant) and for which we expect attractive returns. As set out in Exhibit 36, Mytilineos trades at a very large discount to European diversified industrial companies on all valuation metrics. We do not believe the discount can be justified just by a Greek equity discount. While a discount may be appropriate to reflect a higher cost of capital for Greek companies, we note that the most recent company bond issue (€300m in Q417) implies a 3.1% yield, not completely different from other European industrial companies. In addition, the Athens General index trades at a 20% P/E discount to Euro Stoxx 600 (FY1) vs more than 50% discount for Mytilineos vs European diversified industrial groups. Source: Refinitiv. Note: *After growth capex. Prices as at 11 April 2019. By applying the median P/E, EV/EBITDA, dividend yield and FCF yield of European diversified industrial companies to Mytilineos’s financials, we calculate an average valuation of €16.5/share, 70%+ higher than the current share price. We have identified comparable stocks for each of the three Mytilineos businesses (Exhibit 39). While there are several comparable stocks for the metallurgy and power generation businesses, there are few listed companies similar to Mytilineos’s EPC & Infrastructure business (Metka). Hence, we have included in this comparable group renewable developers, power generation contractors and infrastructure developers, and we believe the median value represents a good benchmark for Mytilineos’s EPC activities. By applying median peer EV/EBITDA values to Mytilineos’s EBITDA by division, we calculate the current share price implies a discount of more than 40% to the equity value. While a discount may be justified by the diversified business model and by the higher Greek cost of capital, we believe this is excessive. Source: Edison Investment Research. Note: Prices as at 11 April 2019. Source: Refinitiv. Note: Prices as at 11 April 2019. Finally, we have calculated the equity value of Mytilineos using a DCF-based sum-of-the-parts approach. Even applying a 15% discount to incorporate the diversified business model, we calculate an equity value of €12.3/share, implying around30% potential upside to the current share price. Mytilineos combines a sustained earnings growth outlook (13% EPS CAGR 2018–22e) with strong cash flow generation (more than €200m free cash flow/year on average). We estimate c €800m balance sheet headroom by FY22 and expect the company to focus on growth capex. We estimate a 3.7% 2018 dividend yield with 13% CAGR. We expect a 5% EBITDA CAGR 2018–22e for the group, with the growth driven mainly by the Power & Gas division and to a lesser extent by the EPC & Infrastructure business. We expect a large jump in profitability in 2019, which reflects aluminium prices hedged at a higher level than 2018, the full-year contribution of flexibility payments for gas-fired power plants and the impact of the large solar projects for the EPC business. We then expect a reduction in FY20, to reflect lower aluminium prices and a normalisation in EPC revenues. Source: Mytilineos data, Edison Investment Research. Adjusted EBITDA. We expect the EBITDA growth to translate into an EPS CAGR of 13%. Even assuming a relatively low payout ratio of around 35% (statutory level), we see the dividend growing at a 13% CAGR. Mytilineos’s net debt/EBITDA was 1.4x at the end of 2018. Thanks to cash flow generation (c €110m/year on average over the period 2019–22) and EBITDA growth (7% CAGR 2018–22), we expect the ratio to fall rapidly and forecast the company to turn net cash positive by 2022. Were the company to re-lever to around 1.5x net debt/EBITDA, we estimate it would have c €800m balance sheet headroom to deploy for new investments by 2022 (taking into account the positive EBITDA contribution of the new investments), which corresponds to c 70% of the current market cap. Our forecasts include a negative working capital variation every year reflecting the growth we expect for the business. In addition, we have incorporated a negative cash flow element into our cash flow in the period 2019–22e to account for the €105m prepayments received by Mytilineos in 2018, which has resulted in the significant net debt reduction. After graduating with a BSc in economics from the University of Athens and an MSc in economics from the London School of Economics, Evangelos G Mytilineos took over the family business in 1978 and in 1990 he founded MYTILINEOS Holdings Group. By acquiring the majority shareholding of METKA (1998), Aluminium of Greece (2005) and making sizeable investments in the energy sector (second largest power producer in Greece), he turned the company into one of Greece’s leading industrial groups. Dimitri Stefanidis has an engineering background and 35 years of experience in aluminium. He joined Aluminium of Greece in 1984, where he assumed increasing responsibilities. He has international experience at Pechiney Group (1992–96) and was continuous improvement director and technical manager of ALCAN’s plant in Tomago, Australia (2002–05). In 2009 he was appointed CEO of Aluminium of Greece and oversaw several cost-cutting exercises that significantly improved the competitive position of the company. Dinos A Benroubi has an engineering background, having studied in the US. He has 25 years’ experience at the TITAN CEMENT Group, where he reached the position of director of cement operations – Greece and spent two years at VIOHALKO, where he served as general manager of the ELVAL Group. He joined Mytilineos in 2006 and was appointed CEO of KORINTHOS POWER in 2009 and general manager of Protergia in 2010. Panayotis Kanellopoulos is responsible for securing competitive natural gas supply for the company’s own use and for the broader Greek market and neighbouring countries. Panayotis joined Mytilineos in 2010 as executive director with responsibility for natural gas activities. Prior to that he was CEO of the Hellenic Natural Gas Transmission System Operator, where he initiated efforts and set up the basis for opening the Greek natural gas market. Earlier in his career, he held positions in MOBIL and BP Hellas, gaining management experience in both sales and operations in the national and international energy sector. Panagiotis Gardelinos graduated from the NTUA with a degree in mechanical engineering. He has 32 years’ experience in the power sector, working in various positions with EPC contractors in Greece and Denmark and joined Mytilineos in 2006. PPC, Alcoa, Norsk Hydro, Siemens, Alstom, General Electric, Acciona. This report has been commissioned by Mytilineos and prepared and issued by Edison, in consideration of a fee payable by Mytilineos. Edison Investment Research standard fees are £49,500 pa for the production and broad dissemination of a detailed note (Outlook) following by regular (typically quarterly) update notes. Fees are paid upfront in cash without recourse. Edison may seek additional fees for the provision of roadshows and related IR services for the client but does not get remunerated for any investment banking services. We never take payment in stock, options or warrants for any of our services.